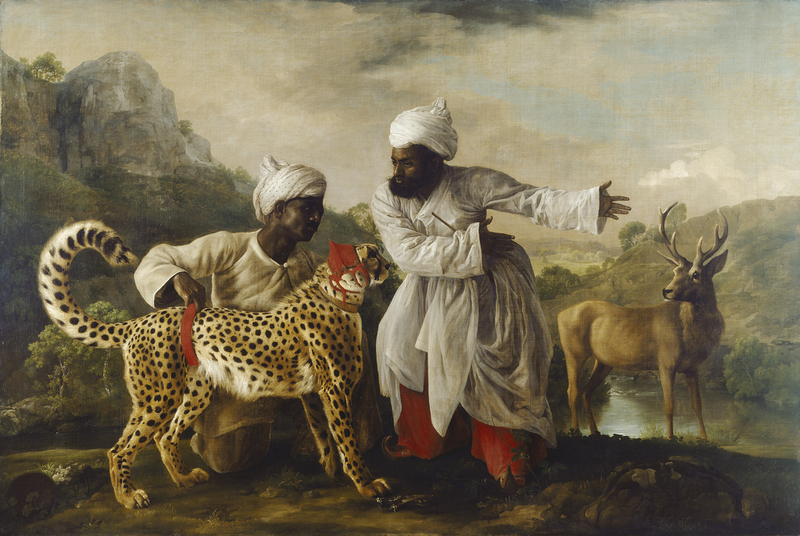 A painting inspired by an incident that took place in 1764, when a cheetah brought to England from India was pitched against a stag in a hunting demonstration at Windsor. The cheetah, seen in profile to the right, wears a collar, a red hood and a red belt harness tied around its abdomen; kneeling to the far side of the cheetah is one of the male figures, wearing a white robe with a single button at the neck and a turban of spotted white fabric, restraining the animal by its belt; he turns his head to the right, looking towards where the second male figure is gesturing. This figure, also with a white robe, worn over a pair of red trousers, and red shoes with extravagantly curled-up toes, has a plain white turban. He looks in the direction of the cheetah and gestures with both hands towards a stag standing behind him on the right. The stag turns its head towards the cheetah; both animals stare at one another. There is an anatomical disparity between the stag’s body, which is based on that of a British red deer, and its antlers, painted from those of an Indian sambar. The scene is depicted on a plateau within an imaginary landscape; to the left are dramatic cliffs atop a grassy slope, to the right, below the stag, is a river, which draws the eye into a landscape of woodland and undulating hills; the sky shows glimpses of blue through a bank of stormy clouds.